3. favored by fortune; fortunate or lucky: a happy, fruitful land. 4. apt or felicitous, as actions, utterances, or ideas. 5. obsessed by or quick to use the item indicated (usually used in combination): a trigger-happy gangster. Everybody is gadget-happy these days. 1) Beloved Husband because he loves me so good. 2) My great big family in Ohio who make me laugh all the time. 3) My Godson and his Mom-- they totally "get me". 4) Friends-- my glorious friends, from coast to coast. 5) Dark chocolate-- the really good stuff or the cheap stuff. I'm easy when it comes to chocolate. 6) A shady spot on a beautiful sunny day. Lupus doesn't let me be in the sun and shade is a treasure. 7) Helping to plan my friend's 100th birthday party next month. 8) Homemade chicken soup and grilled cheese sandwiches for dinner. 9) Seeing my niece's baby bump! In June, I'm going to be a great-aunt for the very first time! --Copy the image and display it on your blog. --List 10 things that make you happy. --Try to do at least one of them today. I pass this award on to anyone who needs to remind themselves of the happy things in their lives and to all the rest of you who want to share your happiness. Thanks to Anne H. for passing this award on to me. Her timing was perfect and lifted my spirits. If you don't know Anne, please visit her blog. In addition to being on a successful weight loss journey, she also has great taste in music and videos. What did you today that made you happy? Joanna Jenkins - coming from you, that is quite the shout out! Thanks - and right back at ya! Congratulations on the award, and what a fun one it is! Great award for you! Mmmmmm, chocolate. And I appreciate your friendship! Wow, planning a party for your friend's 100th birthday. Reaching the big one oh oh is an accomplishment to be applauded. I like happy posts. 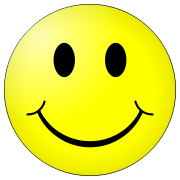 With so much complaining, ranting, negative, what's wrong with my life posts these days, it's refreshing to see big yellow smiley posts. I like my grilled cheese sammies with tomato soup. I totally get you too, Joanna, and your ten happy things are perfect! Wishing you the return of sunshiny dry days soon. Aw, I love my Godson too! Congrats JoAnna great award! Love your list of happiness! !You are a ray of sunshine for me thanks for your bloggy friendship....see ya Sunday! Great list - wow a 100th birthday party? Neat-o! I wrote this list a while ago too - it was hard for me to narrow it down to ten, so I think I cheated and made it longer! Congrats on your award and your list is great!! Chocolate!! The food of the gods! seeing the light come on in the eyes of kids i work with. snuggling on the couch with T.
Congratulation - it's amazing when you actually think about things that make you happy the things you come up with. Can I ask where in Ohio - I know it is big but I have been and know people in Poland, Ohio. I mopped my wooden floors, which I've not done for weeks. They've been swept and vacuumed, so not exactly filthy, but you can tell the difference. It's like walking on silk which feels divine in bare feet. That is what made me happy today. So glad you are feeling happy. It´s always good to remind ourselves of the good things in our lives. You deserve all of your awards and the happiness that you can get. I hope that all of the rain is not affecting your area too bad? I know that you have that pool problem? Yeah - for dark chocolate and the lifting up of spirits. Thanks for helping me start my Friday off with happy thoughts, Joanna! You know, when bloggers like you meme even in a small way, it's extra interesting because it adds more personal dimension to your blogging supremacy. Don't be shy now, you're reigning pretty dang supreme at least in my blogosphere. Naming the things that bring us happiness is always a good mood lifting exercise. I like this award because of the cupcake, also. Reading what you have to say is always a happy thing. Thanks, Joanna. Nice list to contemplate first thing on a rainy morning. thanks for sharing this. My 24 year old son is temporarily living with me right now.. we are having some good moments and that makes me happy. What did I do that made me happy today? For starters I woke up next to my lovey husband! I had a hot shower, followed by a nice cold glass of orange juice. I read my email--and now I'm reading the blogs I follow--that always makes me happy! Thinkinh I will have to do this! Great attitude! I feel happy just reading this post! Such a great list Joanna! I have so many reasons to be happy, stopping at ten would be just a drop in the bucket. I can't even imagine how big the list of your 100 yr old friend is. That must be quite a list! Great list! Just reading it made me smile. 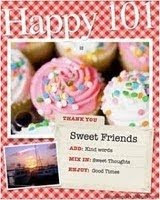 Especially planning a 100th birthday party. What fun!! Woohoo! Congratulations Great~Auntie, I bet ya'll are just chomping at the bits! I thought of you first thing this morning as I was listening to the news. Keep us posted that your OK. That's a lot of rain !!! Almost everything makes me happy, I'm kinda weird that way. I just hope your pool doesn't do any more sliding! Thanks for the reminders -- many of them apply to me as well! aman who loves you good, a baby coming to your extended family, and let there be lots of chocolate :). It is a happy life! yes... chocolate makes me happy too...happy weekend dear joanna! I love your list! I'm a sucker for dark choco, too, and the chix soup + grilled cheese sounds pretty fine as well! But the best ones are about your family. It all just made me feel happy, too! What made me happy today? Having some drinks with a friend and 'switching off' for a few hours. I firmly believe that you get as good as you give in life, Joanna. That is why you have such an amazing group of people around you. family and friends with chocolate drizzled on top. tasty for the soul. Your hubs, the family, the friends, you are loved! Grilled cheese sandwiches are total comfort food to me! I order them in restaurants all the time even though I feel like a child. Let's see...first off CONGRATS! And congrats early for going to be a great aunt. Sweet! I'm happy today for....getting good test results at the doc's! Yea! A great award for someone who makes me happy knowing you. Congrats! Reading your blog makes me happy! I'm excited for you becoming a great aunt. Your niece and her hubby sound like they are going to be wonderful parents. I also love the grilled cheese and soup dinners. When it stops pouring rain, we've definitely got to get together for lunch again, k? Congrats on your award! Thanks for encouraging us to think about happy things. :) Have a great weekend! Love your list Joanna, I have to look up what Lupus is, I have heard of it but just not sure. Have a great weekend. Thanks for all your support on my blogs. TAKE care. What made me happy was to get up this morning, brew some coffee, and drink it at a leisurely pace--no work for me today! I adore chicken soup and grilled cheese sandwiches for supper! Chocolate and Diet Coke. Going out with friends. Time laughing with my husband.